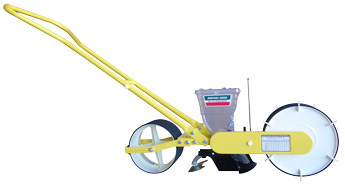 The Clean Seeder AP is ideal for planting small seeds including vegetables, herbs, and flowers. Both single-line and multi-line AP models are available in push planter and tool bar mounted styles in a variety of configurations to suit practically any small seed planting situation. 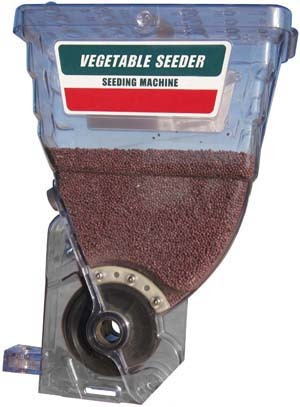 The Clean Seeder AP features a unique seed metering system that allows you to plant a wide variety of small vegetable seeds with a wide range of seed spacing. 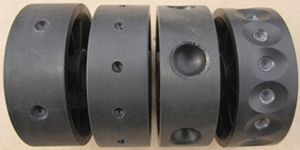 At the heart of the metering system is the seed metering wheel. Cells in the wheel hold seed in place. As the wheel rotates, seeds are singulated into the cells, then carried past the repeller brush and dropped into the planting shoe/ground opener. 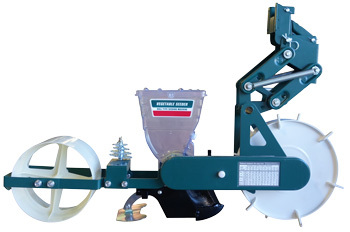 Click here to visit our Seed Metering Wheels page for a list of wheels and seed spacing chart. The metering unit is driven by the front wheel of the planter. 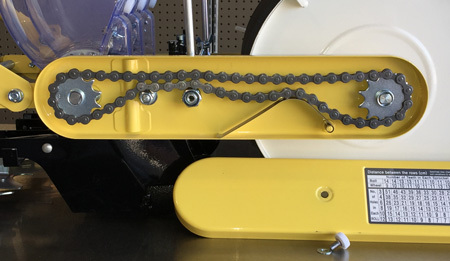 Drive is transferred via chain to an 11-spacing transmission. Five sprockets (included) can be paired in different combinations. By pairing the sprockets in different combos and choosing different seed wheels, any seed spacing between 3/4-inch and 10-inches can be achieved (exact spacing depends on sprocket pair and number of cells in the seed wheel). The metering system is specially designed to plant a very small amount of seed, and it can also handle a large amount of seed. The standard hopper can hold about 2 pounds of seed, and has a very narrow channel between the seed wheel and seed pickup area which allows for planting very small amounts of seed (ideal when seed quantity is limited), without restricting the flow of larger volumes of seed. A removable seed-sizing lid covers the seed hopper. 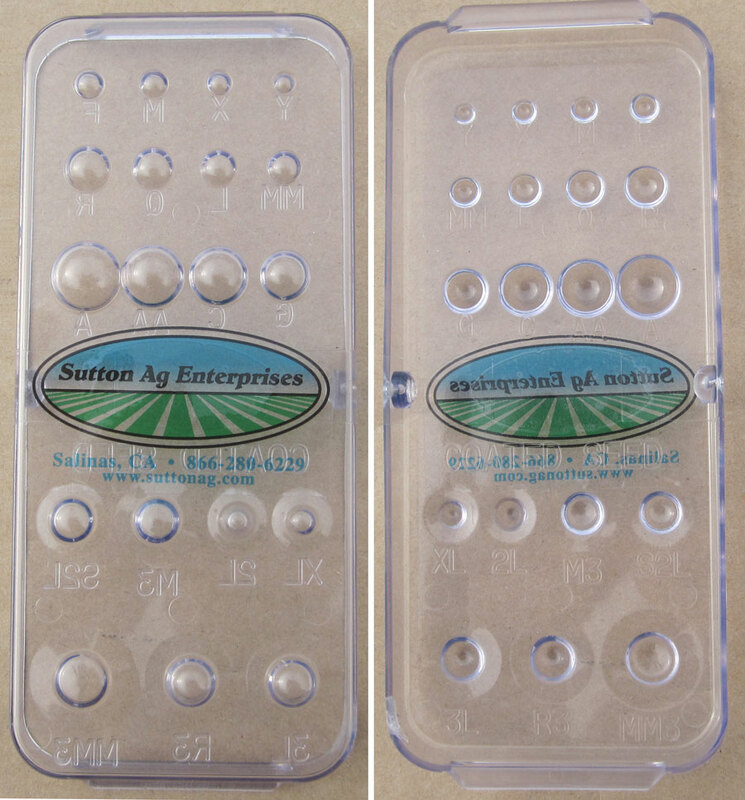 Cells molded into the lid are matched to cells molded into seed metering wheels. Handy letter code listed on lid corresponds to letter code listed on seed wheel (click on picture to enlarge). Seed metering wheels and sprockets can be removed and reinstalled without any tools for easy seed changes or seed spacing adjustments. Checking seed level and observing seeding operation is a breeze thanks to the durable, clear plastic seed hopper. Removable seed-sizing lid (click to enlarge). If you're familiar with Jang seeders, you'll note the Clean Seeder AP is very similar to the Jang model JP-1 hand seeder. Many Jang seeder parts and Clean Seeder Parts are in fact interchangeable. The main feature which sets the Clean Seeder apart from Jang seeders are our modified shoe and soil coverer. A wide variety of inexpensive seed wheels are available allowing for planting of practically any small seed crop. Visit our seed wheels page for more information. Exclusive to Sutton Ag's Clean Seeder AP are our specially modified planter shoe and soil coverer. 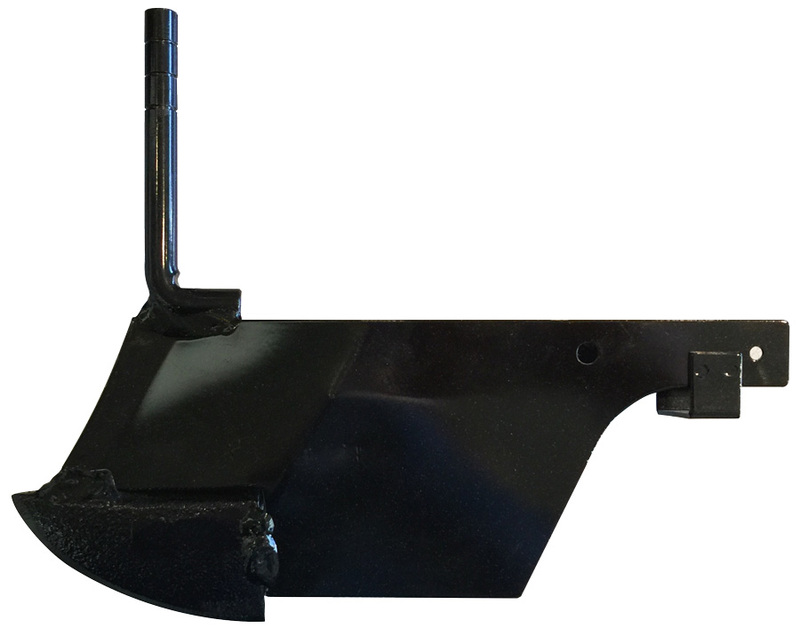 The standard shoe (ground opener) included with Jang seeders and similar planters offere minimally adjustable planding depth, and opens a trough that's about 1-1/8" wide. Our shoe features a special tip made of chromium which will not only retain its shape and remain sharp longer than the standard shoe, it allows for greater planting depth control and opens a narrower trough (about 3/8" wide) for more accurate planting overall. Our modified soil coverer smoothes the disturbed soil back over the planted seed line, leaving a very neat and consistently level planting bed (it does not "mound" the soil as standard coverers do). Our modified planter shoe with durable chromium tip is included with Clean Seeder AP planter units (click to enlarge).